Hundreds of car trailers for sale! Flatbed, Enclosed, and wedge car trailers in stock. New and Used! Shop the lowest prices on PJ car haulers, Load Trail car haulers, Diamond C car haulers and all sizes of enclosed car trailers. Aluminum, flatbed, and enclosed car haulers can all be found here on our easy to use website. 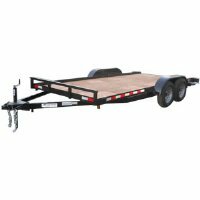 Browse these categories under "Car Trailers for Sale"